I told Mom that she had to let me blog during our anniversary week celebration – after all, I am the inspurration behind this site! It’s been such an amazing year for Mom, and also for me, because when Mom is happy, I’m happy. I think it’s a bit ironic that the first real post on this site that Mom wrote was titled Amber is on a diet – but I guess I really needed it then, even though I still think that I was only big-boned and fluffy, and didn’t really need to loose any weight. However, I know Mom wants me to be healthy for a long long time, and I guess being overweight is as bad for kitties as it is for people, so I reluctantly cooperated with the whole diet thing. (This is where opposable thumbs would come in handy – I’ve figured out how to open the cabinet where Mom keeps my food, but I can’t seem to figure out how to open the cans…) I’m happy to report that a year later, I’m back to less than 13 pounds, which Mom says is a good weight for me (and our vet, Fern, agrees). Mom’s been feeding me some really yummy stuff lately – it’s called raw food, and you’ll soon read more here about why it’s so good for kitties. It sure tastes good! This past year, I’ve written eighteen posts in my own Amber’s Mewsings category. I got to write about everything from how much I love to be my Mom’s mewse to what it felt like to be forced to have my teeth cleaned (nothing to love about that!). I have fun writing my column, and I know it gives Mom a break from having to come up with new stuff to write three times a week, which I guess can be challenging for a human. I keep telling her to let me blog more, because I have lots more to say! There are lots of exiting things coming up for our site for this next year. Mom said she’s going to do something called a teleseminar series – I don’t really know what that means, but she says that it’ll be another way to teach people stuff about cats and their health and their lifestyle. Sounds good to me. There’ll also be lots more giveaways – I guess humans love getting stuff for free, and Mom likes to give stuff away that she thinks our readers would enjoy, so look for more of those things. And most importantly, there’ll be lots more mewsings coming from me! And don’t forget to enter our anniverary giveaway for the cool gift basket my mom’s friend put together for us! It’s one of my favorite photos of Amber, Esme. How poised and regal you look in this photo. It’s nice you cooperate to have your picture taken. My Abbey isn’t fond of having her picture take and I’d really like on of her, she’s so beautiful. Congrats on 1 year anniversary!!! What a beautiful photo of Amber. I wouldn’t be surprised if they are communicating. Energy is the same for humans and animals and love heals all. Amber frequently gets a far-away look in her eyes these days. I’m guessing she’s communing with Domino when that happens, Layla. Amber, you are an inspurrrration near and far. I can’t help but think that the long distance love and caring you have for my feral boy Domino has mellowed him out. Come see his latest photo at Cat Saturday. Thanks Amber for the approval of your Mom’s suggestions. Now our Mom is excited because she might be able to help Mewmew. Hope you and your Mom have a great week end and was glad to hear that the book signing went well. Take care. 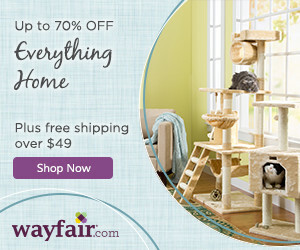 Marg, I like the Felidae brand (the link you posted). I also like Wellness Core, Nature’s Variety Instinct, and Innova EVO. They’re all grain-free, and they come in a lot of different varieties. And they’re all approved by Amber as being very tasty! I get all my food at PetFoodDirect.com – they carry all these brands. That is the url to something I found on the Internet. The girl wrote back and says it is grain free. It is expensive but this cat is very special to me. Let me know what you think. Hi Amber, it is great to meet you. And congratulations on your 18 posts. That is terrific. Your Mom wrote me a nice comment on our blog and so I wanted to ask her a question if you could pass it on to her. I was wondering if she had some suggestions on some grain free food for our sister Mewmew?? Poor Mewmew has bad gums. Our mom has found some food that is grain free supposedly on the Internet but she doesn’t have the url right here. I was wondering if she would check it out. I will come back and leave another comment with the url. Thanks Amber for letting her know. And tell Mom thanks so much for taking the time to try and help our Mom. Thanks for our first canine comment, Watson! It sounds like you’re a very wise dog who actually understands kitties – there aren’t that many of you. Welcome to our site! Elizabeth, Amber is practicing how to say diet-schmiet – she really likes the way that sounds. Cookie, Amber says young and svelte is highly overrated. Dignified and serene is much more important! Wow, 18 postings by you, Amber! You are a busy gal. I hope you don’t mind having a, gasp!, canine pop onto your mewsings. Your great personality sure does come thru in your writings. I can’t believe a full year has past already. It seems only yesterday when I met your sister Buckley at the animal hospital where your mommy used to work. You and your sister sure did change your mommy’s life around for her. Good thing she had you both to help point her in the right direction. I’m sorry your sister had to pass over so soon, but I know she is nonphysically still with us and is teaching and helping a whole lot of humans thru her book. And you do that too with your mewsings. You’re two special felines! Amber, being a little plump is cute and cuddly when you’re younger, and I am built to have rounded features, but when everything starts to sag…it’s not a pretty sight. At 17, I wish I’d been more aware of my figure when I was younger! That little snip Kelly is only two years younger than me and still has the figure of a prime adult, but then, she’s not dignified and serene like me. Congratulations on 18 posts! I’ll have to consider shoving my mom out of the way to see if I can post my thoughts. 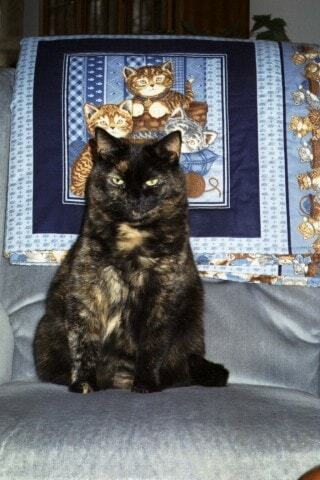 I look forward to hearing more from you, we of the Tortie Sisterhood! 18 posts is a lot, Amber! Big boned and fluffy is fine! Diet-schmiet!